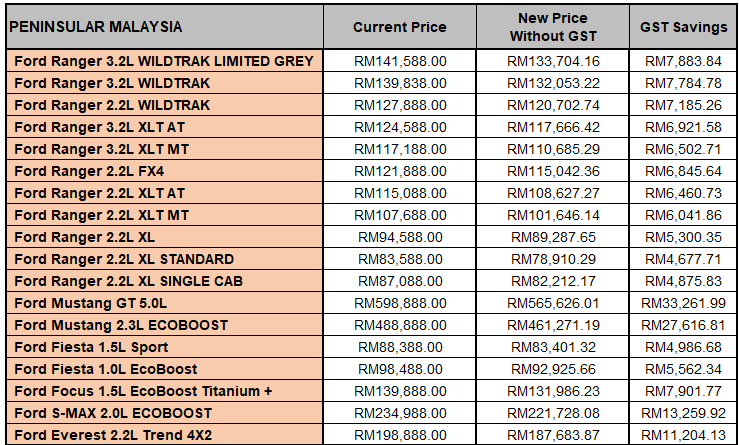 KUALA LUMPUR, Malaysia, 22 May 2018 – Sime Darby Auto Connexion (SDAC), the sole distributor of Ford in Malaysia, today announced the updated prices for its full range of Ford models, effective 1 June 2018 in conjunction with the implementation of the zero-rated GST. “There is no better time than now to own a Ford. The tax-free timeframe between 1 June until the implementation of the SST offers a great opportunity for customers to enjoy substantial savings across our full line-up” said Syed Ahmad Muzri Syed Faiz, managing director, Sime Darby Auto Connexion." 1. All prices stated are on-the-road without insurance for Peninsular Malaysia and private registration only.